When I saw this recipe in “Anatolia – Adventures in Turkish Cooking” book, I immediately knew that I had to try it. 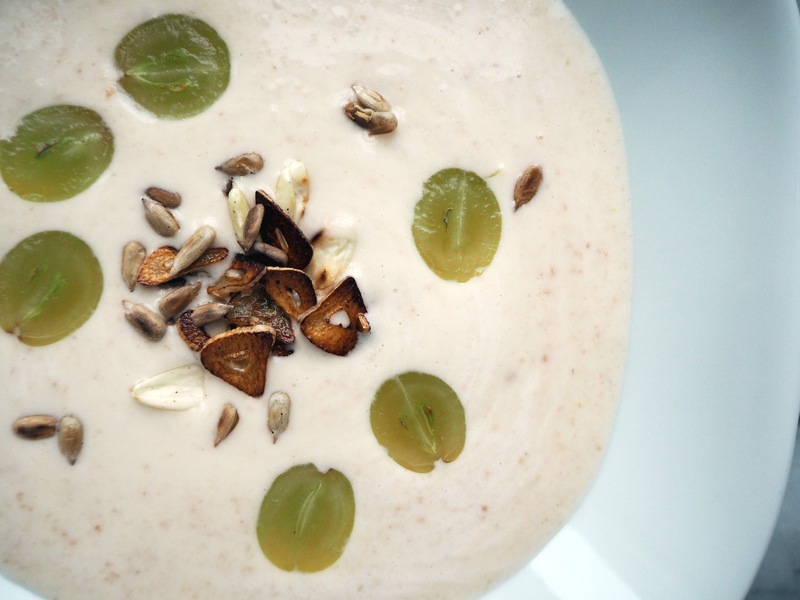 After all, the soup combines two of my favourite ingredients, garlic and almond, in my favourite food form! 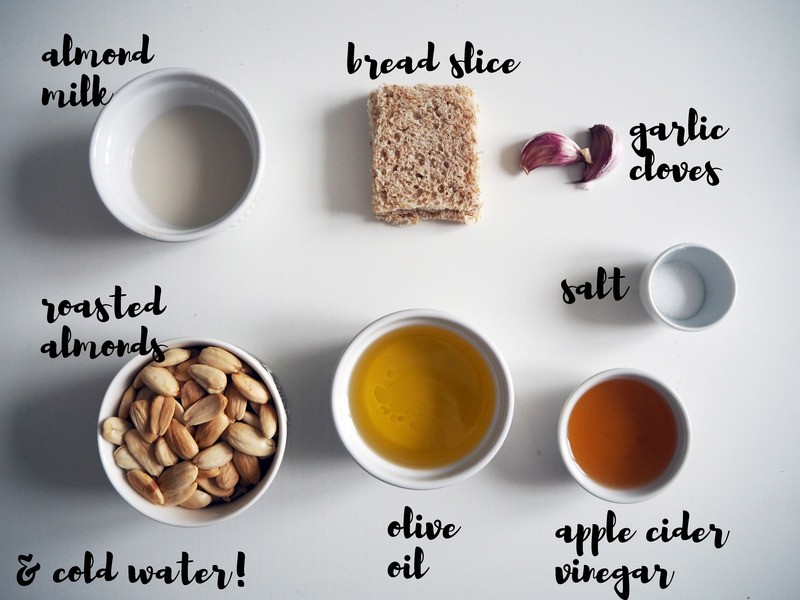 If you start looking around on the Internet texts about soup that contains both almonds and garlic, you can find many different versions, from different cuisines. For instance, there is Spanish version that uses saffron, there is a version that adds a couple of potatoes in it, there are both cold and warm versions.. 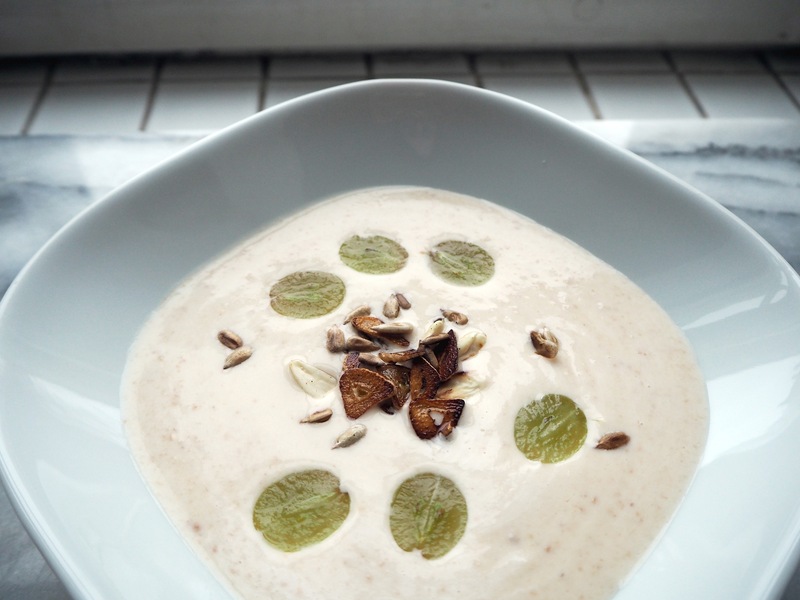 This one I made, in the cookbook I mentioned in the beginning, says that it is the cold version of 16th century Ottoman creamy almond soup. When I made a research about the original Ottoman recipe, I saw that it was generally made with beef stock and had some ingredients that are not in this version, such as grated coconuts or white pepper as a spice. 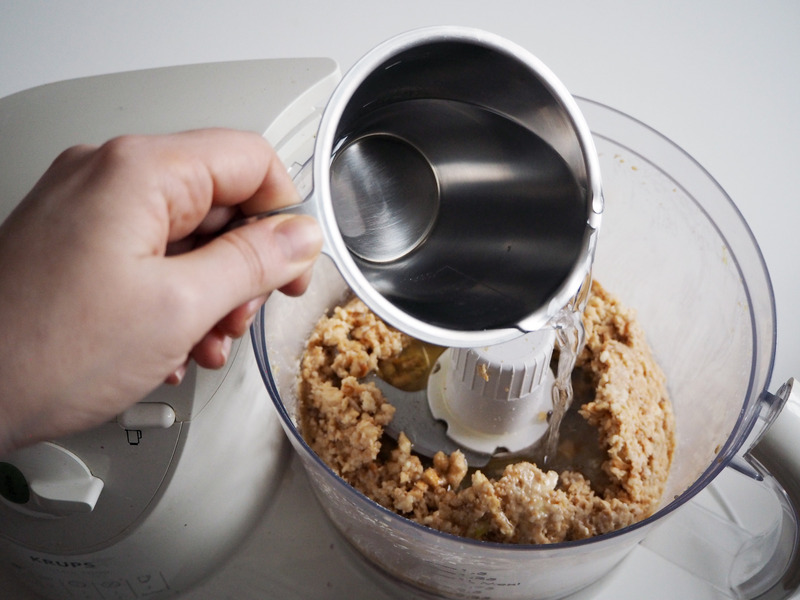 However, I absolutely liked this cold and very simple version with a handful of signature ingredients without too much of a hassle – both time wise and taste wise. 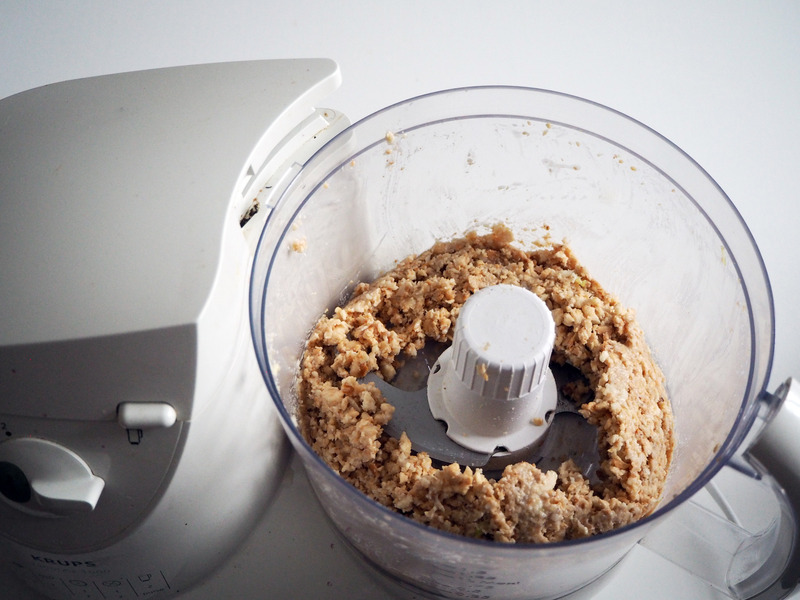 I made minor changes in the recipe though. 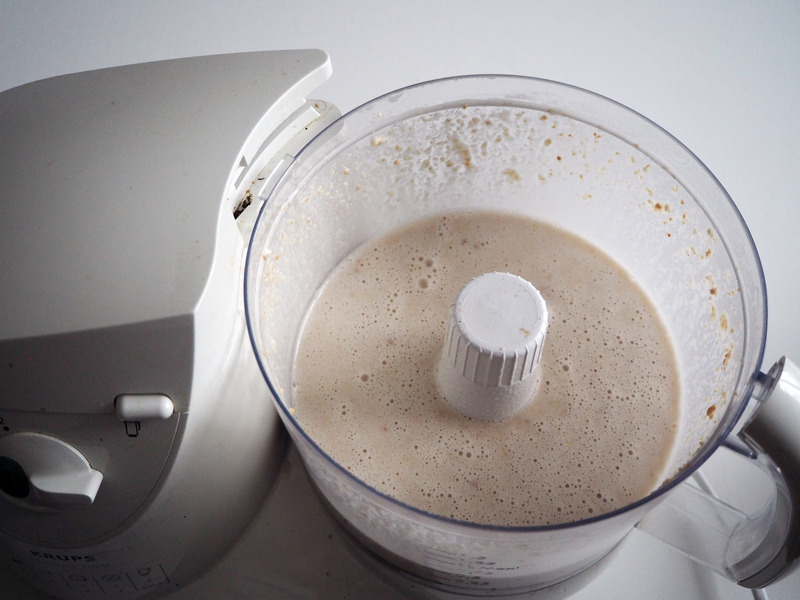 I added a little more water and almond milk. 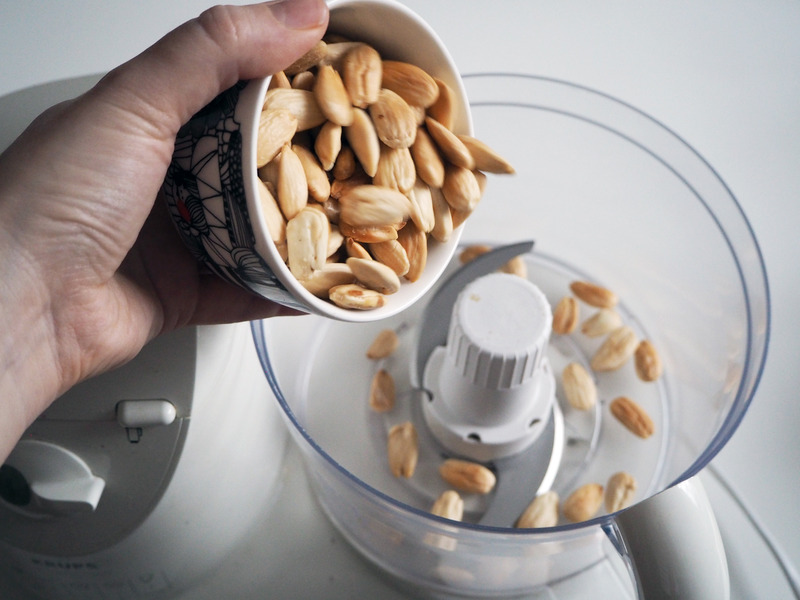 I roasted the almonds first, because their taste triples when roasted. 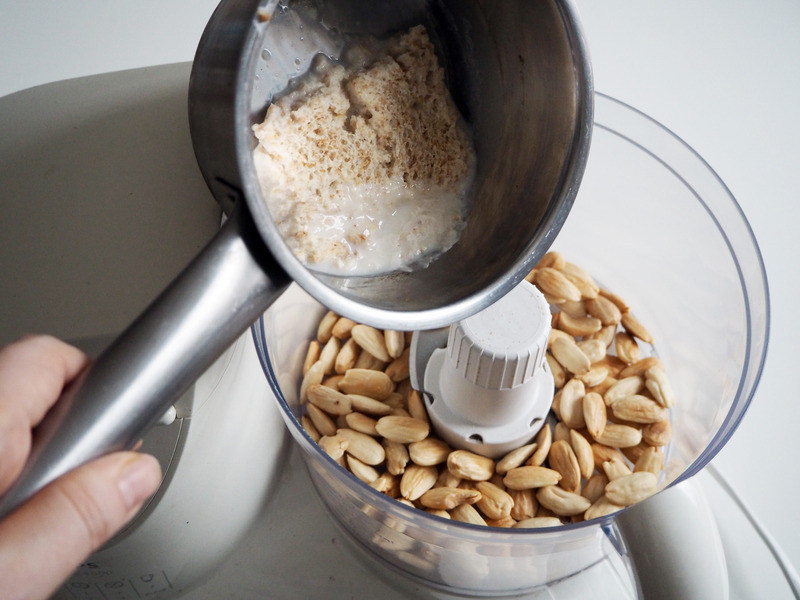 I added some more roasted almonds and roasted sunflower seeds in the topping. 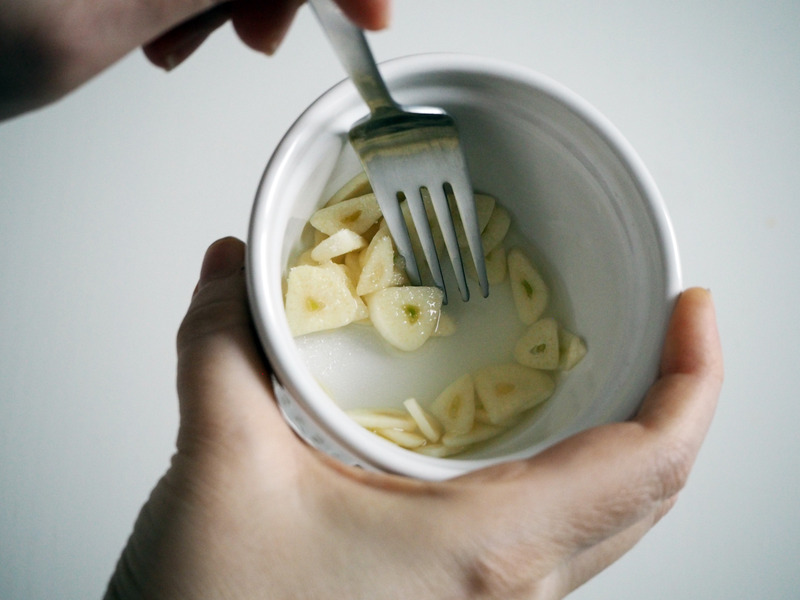 And I didn’t make it 100% smooth – there is just a little bit of teeny tiny pieces of almonds that add some texture in the soup. Finally I added less vinegar (half of the original amount) because the first time I did it with exactly the same amount of ingredient, my stomach burned badly and there was too much vinegar taste in the end. 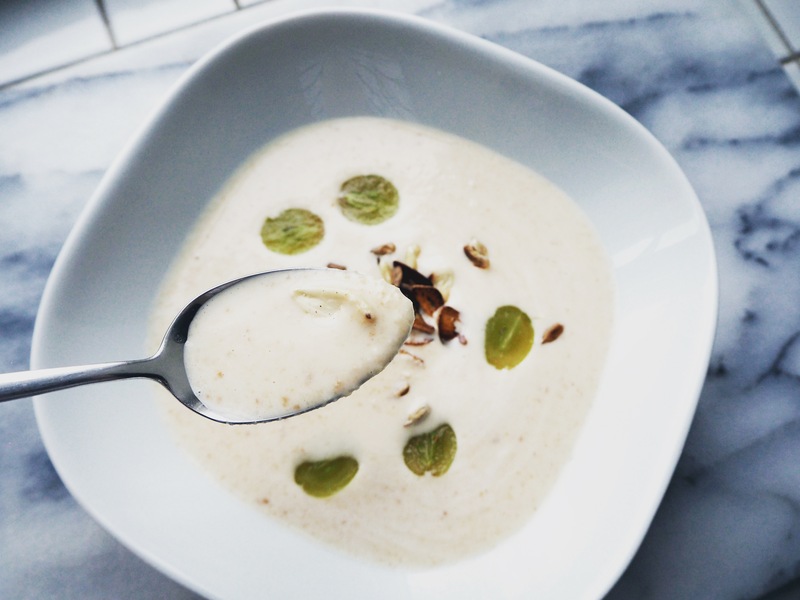 Well, I know that it is still very cold outside and we all generally want to warm ourselves with soup, but try this soup in any weather and you will still get the comfort that soup gives. Enjoy! 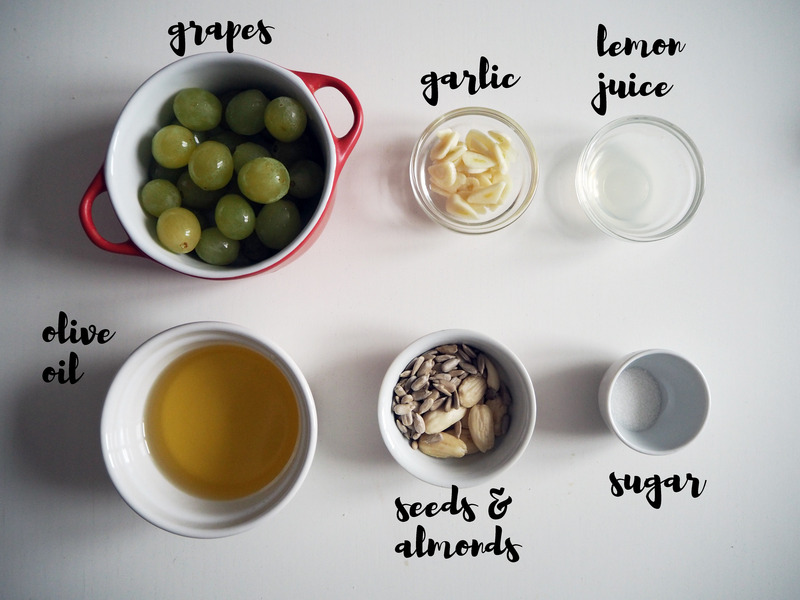 *If you have almonds with skin, check here to see how to remove the skin: http://toriavey.com/how-to/2012/10/how-to-blanch-almonds/. 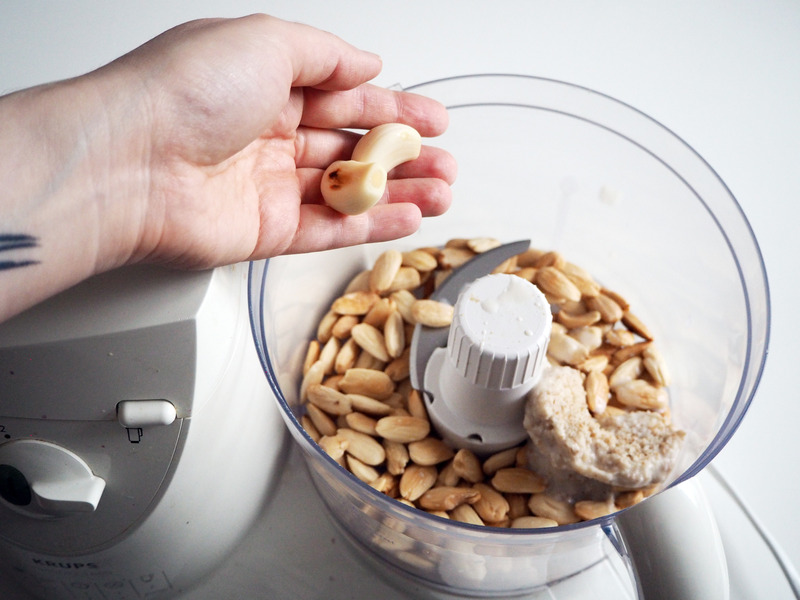 In order to roast the almonds, preheat the oven to 180C then put the almonds on an oven tray with baking paper and keep them in the oven for about 10 minutes, until they turn light brown. Let them cool before using for this recipe. **I’ve seen in some forums discussion about sugar being vegan or not (or which types of sugar are vegan). 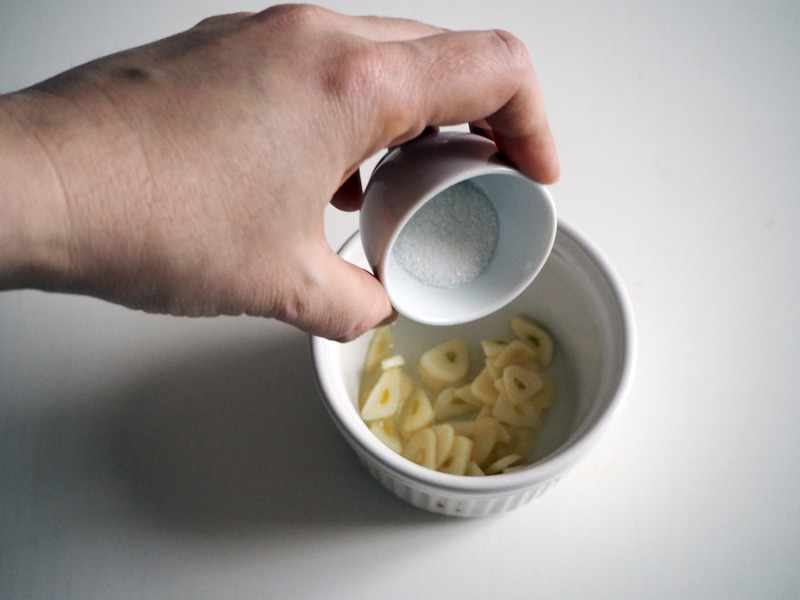 You can check if the sugar you use is vegan or not with information on PETA’s website: http://www.peta.org/living/food/is-sugar-vegan). 1. 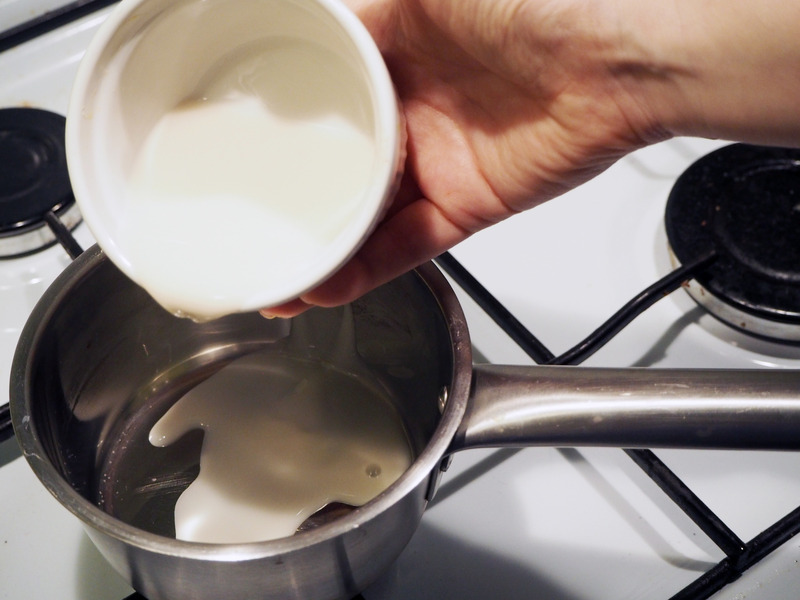 Put almond milk in a saucepan and bring to a boil. 2. 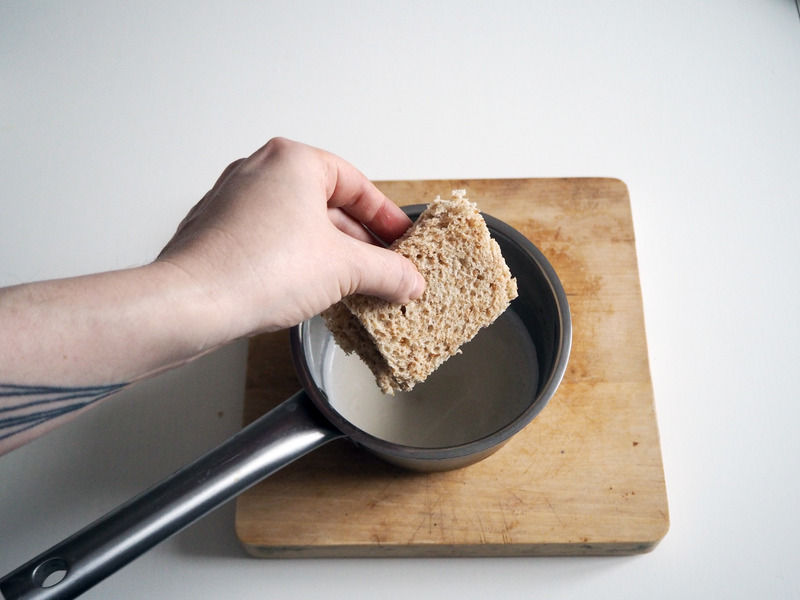 Soak bread slice in warm almond milk, put aside to cool. 3. 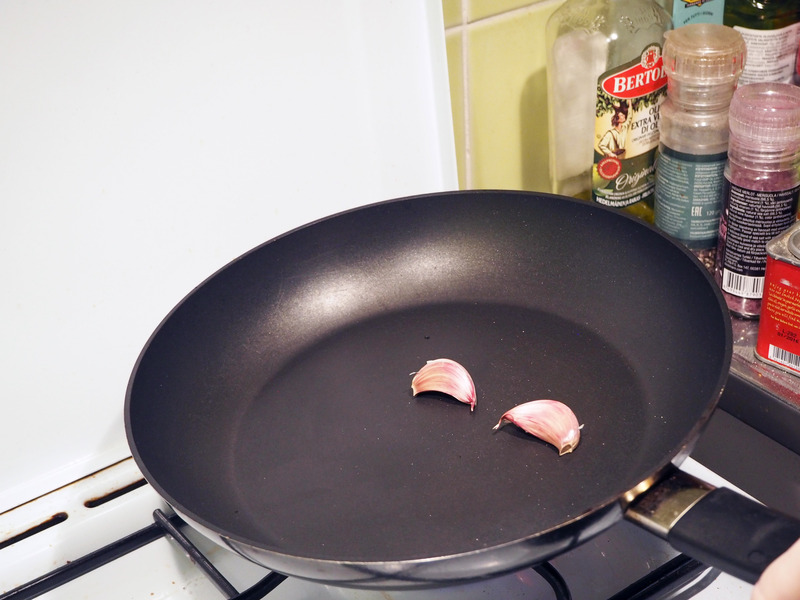 Put garlic cloves with skin on a dry pan with no oil whatsoever and roast for 4 minutes on medium high heat, shaking the pan often. 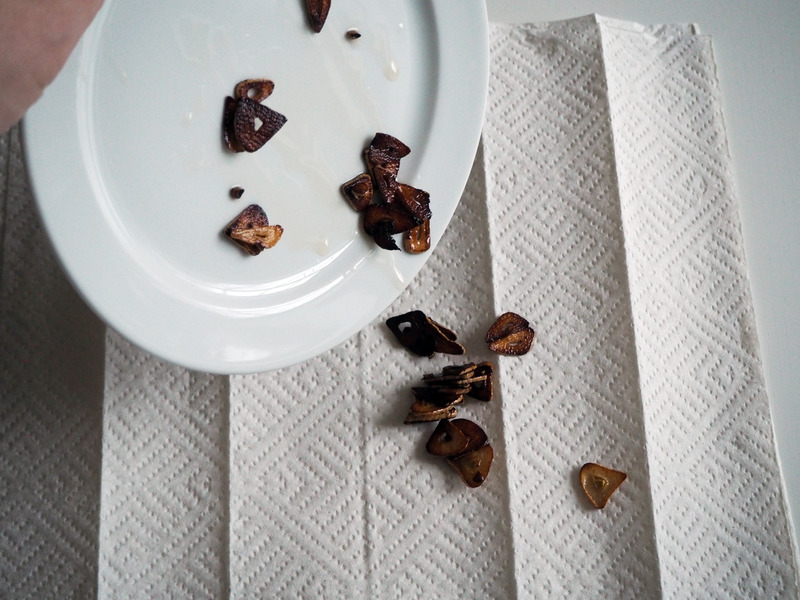 Once done and garlics cool down for a couple of minutes peel their skin and discard any parts that are burned (in my garlic there was a slight brown spot but I kept it because it was not “burned”). 4. 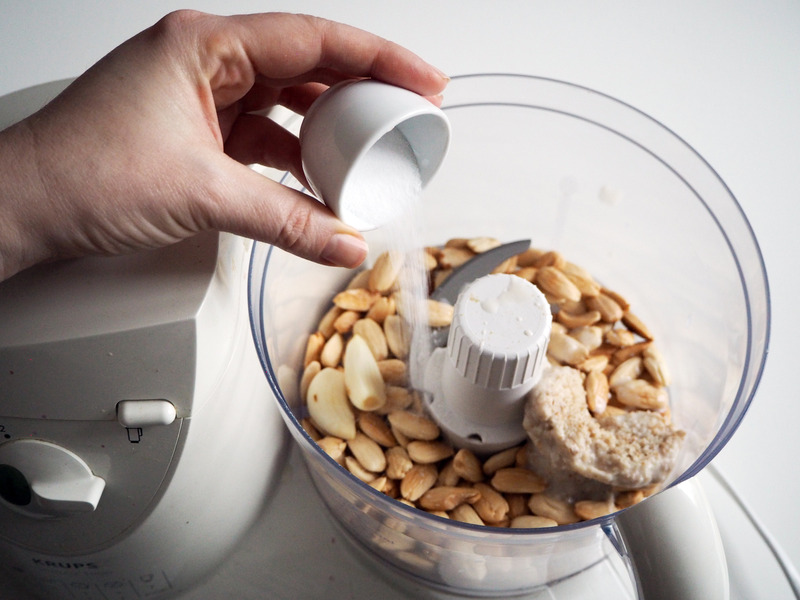 In a food processor, add roasted almonds, soaked bread with almond milk, garlic cloves and salt and process it to a paste, as smooth as possible. 6. 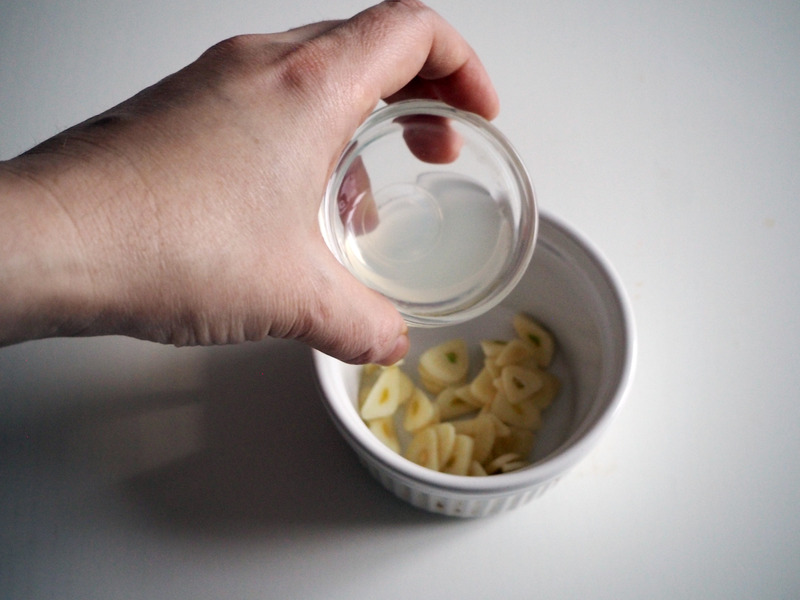 Transfer the soup in a bowl or a storage box, add vinegar and stir well. 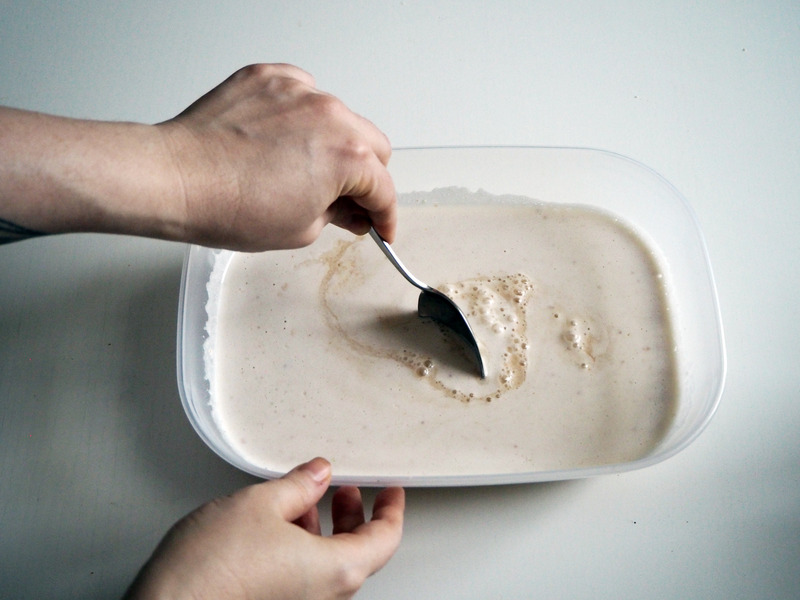 Put the soup in the refrigerator for 30 minutes. 7. While the soup is chilling, prepare the topping. 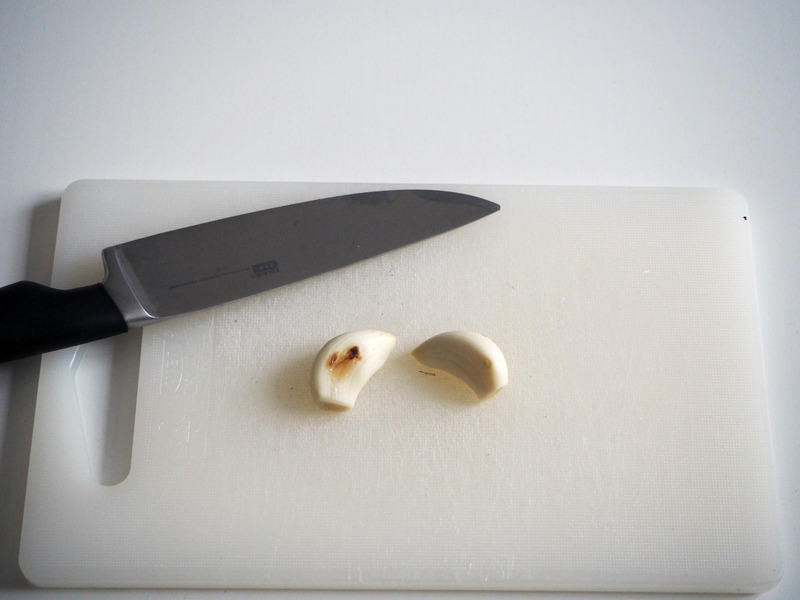 Mix finely chopped garlic cloves with lemon juice and sugar. 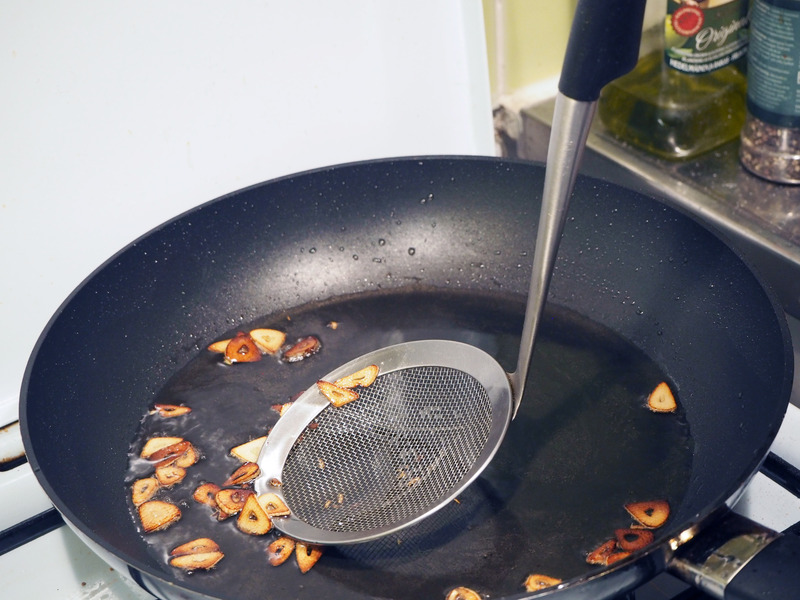 Discard any remaining extra lemon juice (I used a strainer to take the lemon juice away). 8. 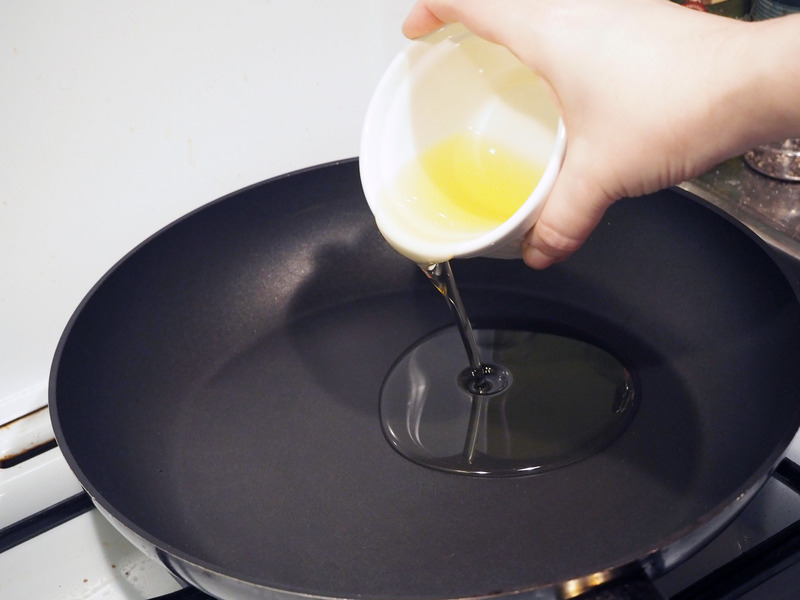 Put olive oil in a pan and heat it over medium high heat. 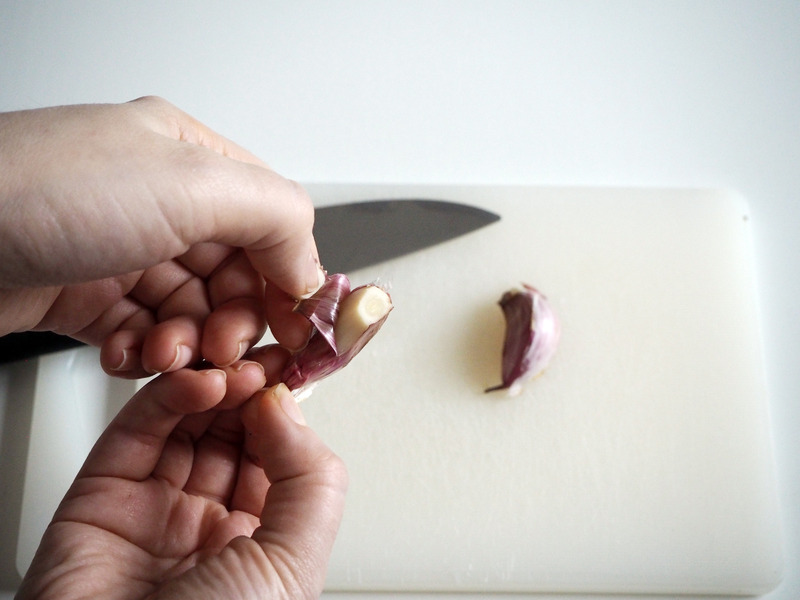 Once it is hot (and you can check this by sacrificing one garlic slice), put the garlic slices and let them brown, which will happen very quickly so do not leave and do something else. 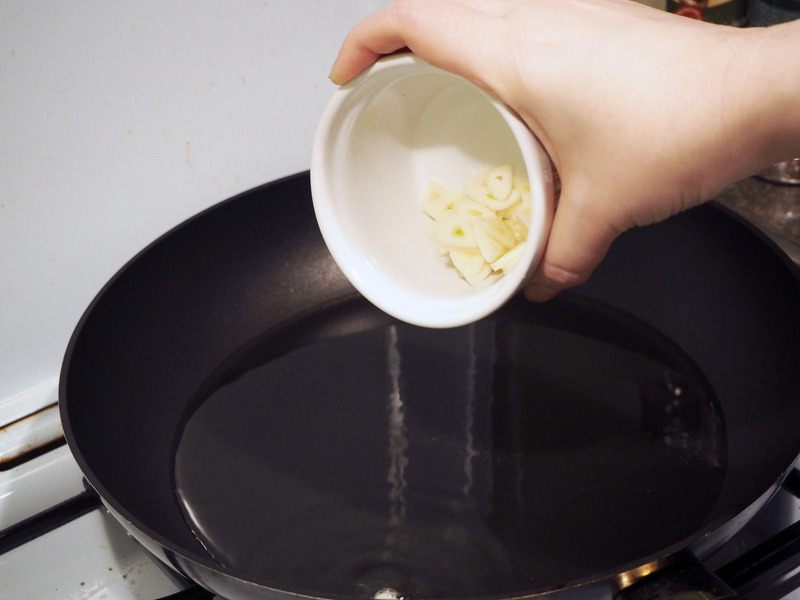 As the garlic slices are wet with lemon juice, a bit of oil will splash around, so keep yourself safe from oil explosions (this is why I told you to discard the extra juice in step 7). 9. 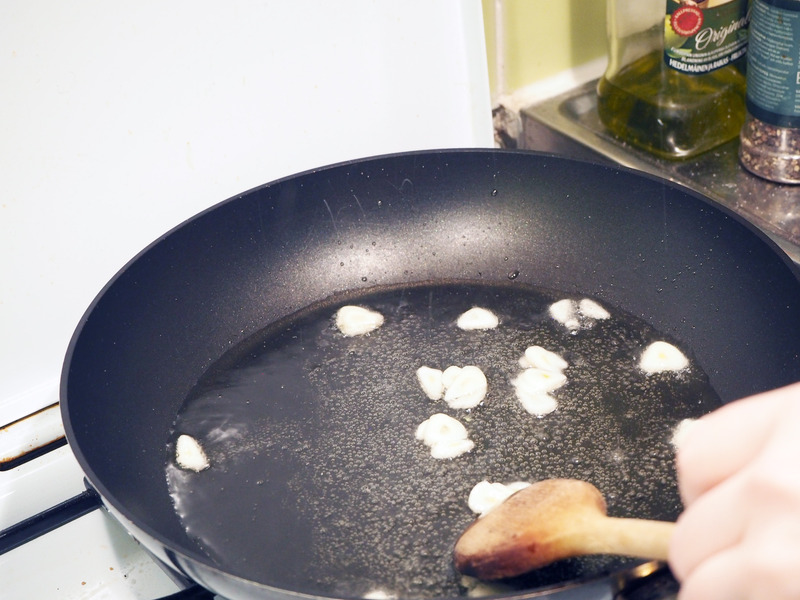 Take the browned garlics from the pan with a slotted spoon and put on a kitchen towel to take the excess oil. 10. 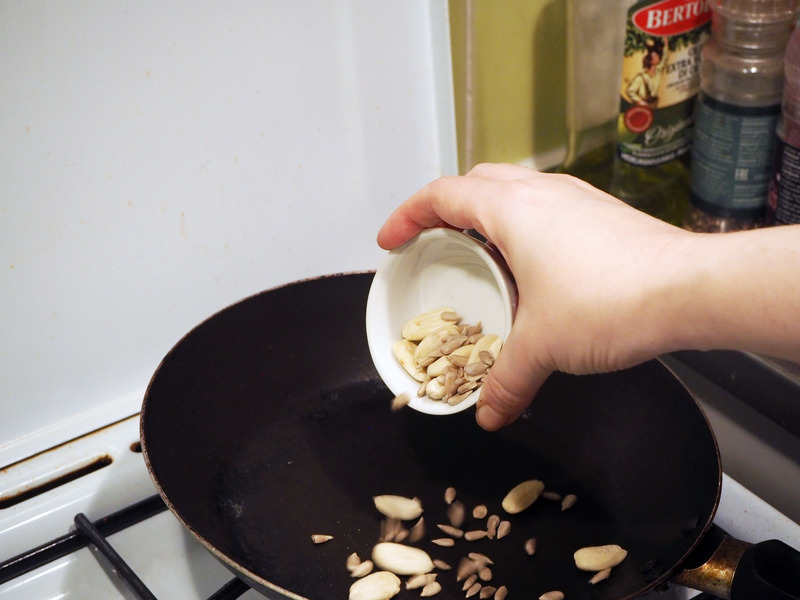 In a clean and dry pan, put seeds and whole almonds and roast them on medium high heat until they get slightly browned. 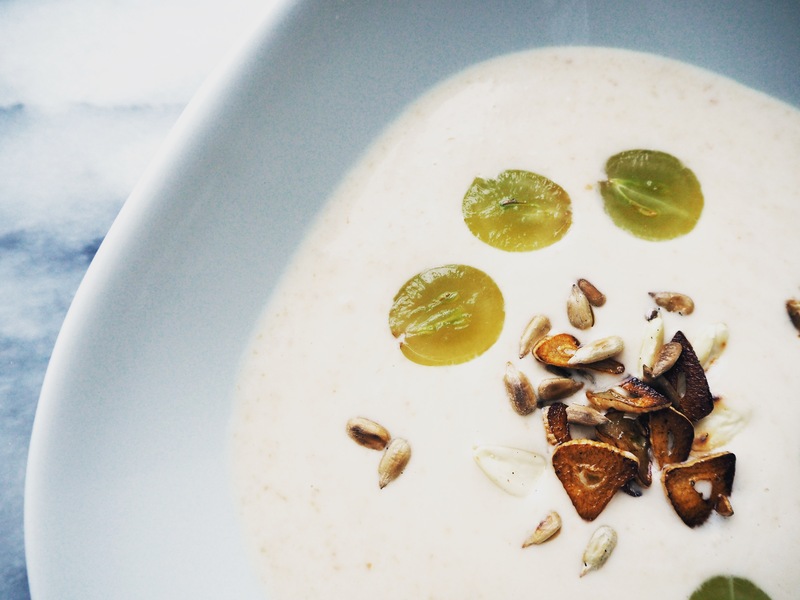 Take out the soup from the refrigerator and divide into four bowls, top with roasted almonds & seeds, garlic and halved grapes (or pomegranate seeds if you prefer). 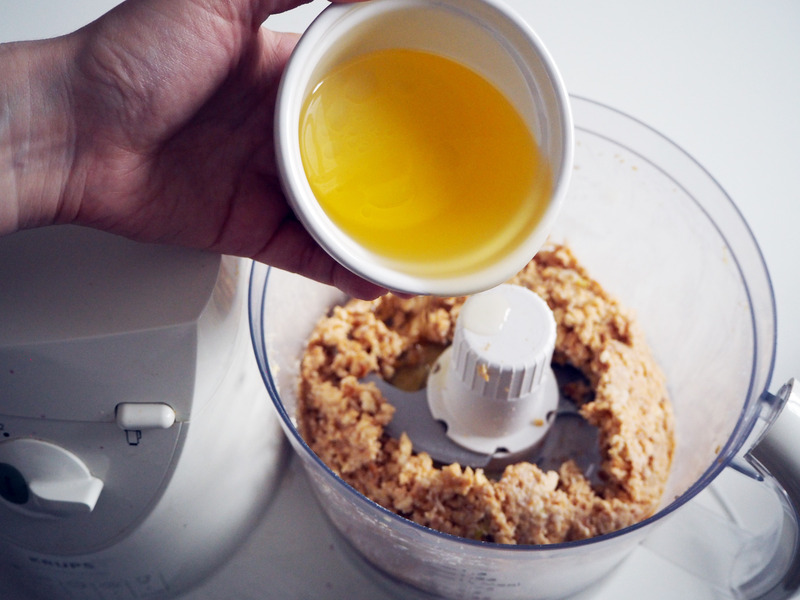 If you want (I don’t), drizzle a little bit of olive oil on top. Enjoy! This soup looks so inviting! Thank you for reminding me how much I like cold soup. May have to try this one. Oh lovely to hear! 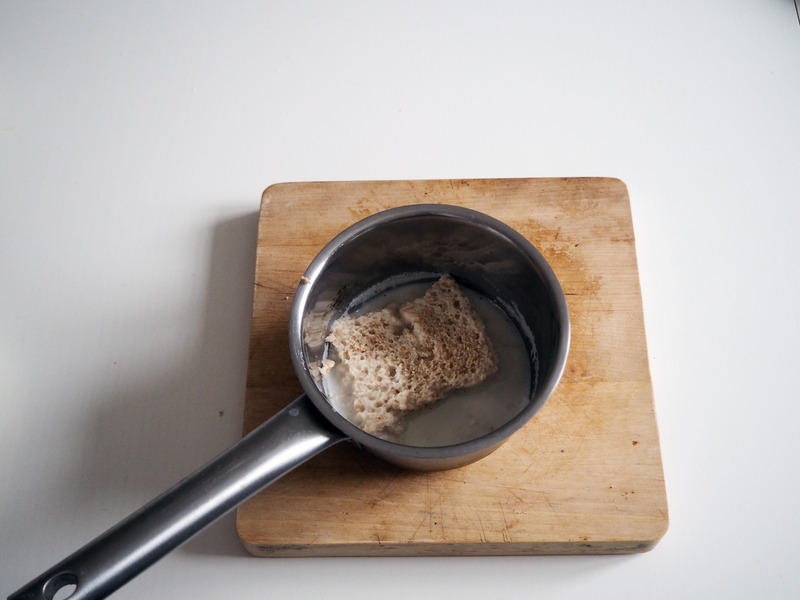 I find this soup very addictive! :) Enjoy! 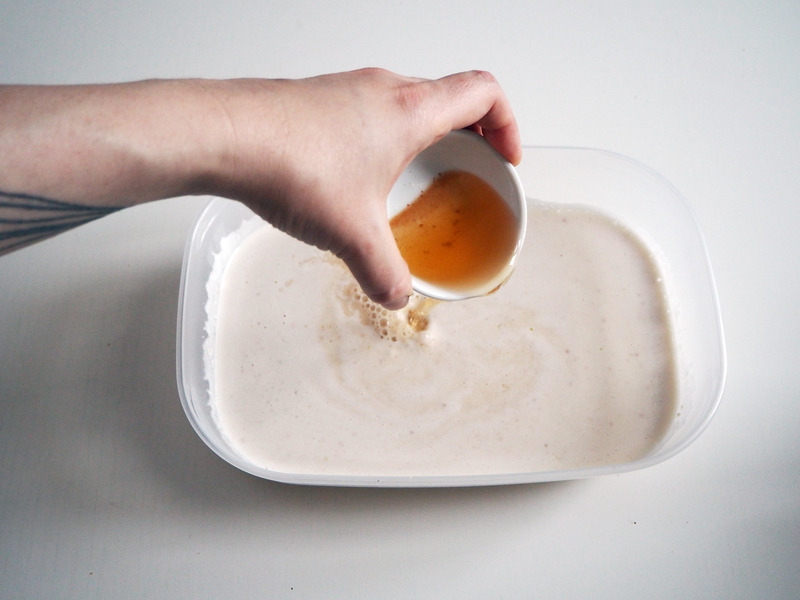 Next PostCoconut Flan – I Am Obsessed With Flan!